A while back Haje Jan Kamps kickstarted TriggerTrap – an open-source magic camera trigger box. This box has evolved into TrigerTrap Mobile, a similar device that relies on the smarts of a smartphone rather than of a box. When Lorenz Bee asked me if I wanted to post a DIY version of the dongle, I asked Haje. He was totally cool about it and gave his blessing. I think it may be a cool project to experiment and understand how camera triggers work, better that reviving an old mouse anyways. If you just want a cool trigger for you camera that uses a smarphone and don’t really care about soldering, just grab the dongle here, and the app here (iOs, Android). Otherwise, if you are doing the solder thing, just get the app. 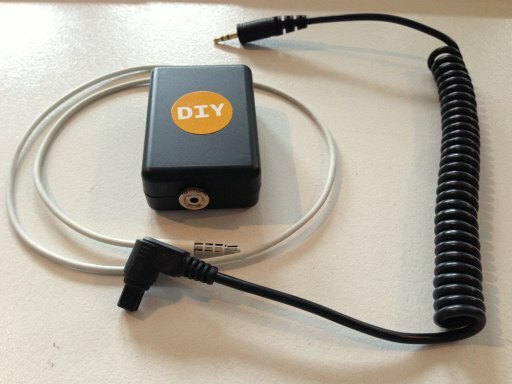 If you have some basic soldering know-how making a homemade dongle should be pretty easy. The whole thing should then be soldered together as per the below diagram. The circuit is designed for all Canon cameras which have a socket for a wired remote control. For testing, do all the soldering bits and test if it works. (In my version, I use a 2.5 mm jack, because I use a special plug for my 5DMKII and can using the 2.5mm plug, I can also trigger from my radio triggers). After a few minutes of soldering you should have something like this. Check it against the Trigger Trap app, and it should work. (I tested it with the TT for iPhone). If it does not work, go over your soldering. If it works, place it in the housing. I had one of the cables too short, so without further ado, I took my old iPhone headphones and separated the heads from the cable. Now I had a beautiful white cable to go with the box. Of course, you could so that with any other 3.5mm jack cable. I drilled two holes In the case, one for the jack that goes in the camera and one for the cable that goes to the phone. I fixed the circuit board inside the housing with a small drop of hot glue and was done. For the first test I timelapsed the New Year’s Eve, along with the New Year’s fireworks. It should be noted that this circuit will not work on many devices. Triggertrap actually had to release another design since the volume on many smartphones will not trigger the camera with the design in this article. I’m using this one with a 3GS with no problem. I tried both designs for the DIY version and neither work with a SG SII. Both work when triggered by audio from other devices, so the circuits weren’t bad. 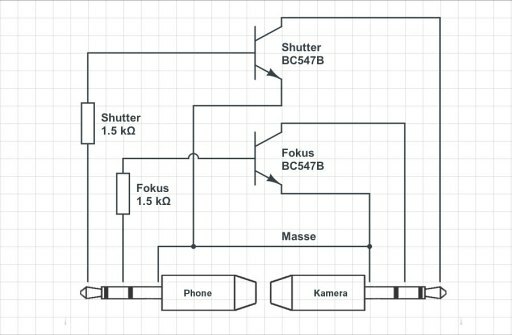 I think that this http://bitshift.bi.funpic.de/en/dslr-remote/hardware/cable-s.php and this https://www.diyphotography.net/files/images/7/diy-triggertrap-01.jpg have opposite connections to the phone end. I built one myself. It works with MotoX and Galaxy Nexus, but the new Nexus 5 can’t seem to drive the transistor… It seems you’ll need to amplfy the signal. Yeah, I just discovered this much to my disappointment. I built one which works perfectly on a Canon 60D but fails on my Canon 6D. Guessing it’s something to do with the CL-N3 cable requiring different power/resistance? Weirdly, it works using my iPad but not my iPhone 5. Is the circuit the same for Nikon cameras? Why did you choose the BC547 transistor? Is there an advantage over similar circuits I’ve seen using opto-isolators or SCRs? will it work with 1.3 or 1.8 kilo haom? @18a1387ecc2cdb3e0a9a1078c06074b1:disqus you mean i should replace BC547B with 2n2222a transistors? Mine did not work. The diagram is as above but my iPhone 4 doesn’t trigger. Any suggestions? I have a problem. It’s not working on my Sony Xperia ZL but on my iPad does. Don’t know if it has to do with the app version or if the preamp of the phone isn’t that powerful to trigger the camera. Please! Check DSLR Remote android app diy cable link above. I think these both are same. I’ve build the cable. I want to use it with my Sony a55 but: focusing works but the shutter not. Any idea or tip for special Sony settings in the app?! I have the same problem with the A55. you are then solved it? 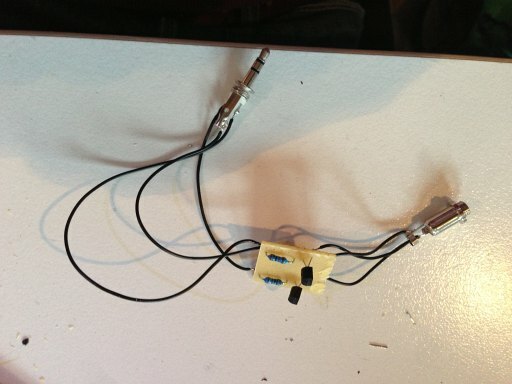 It’s okay to use a 1/4W resistor. That circuit does not generate that much heat to use a 1W resistor. Hey bro, It is not working on my nikon d3200 + htc one X. In bulb mode , both in camera and phone app, the shutter does not stay open, and the camera keeps taking photo after photo.. Any ideas? Thank you. have the same problem with my Nikon D5100, any ideas about this problem? Hi Mateo, where did you find the MC-DC2 jack for nikon cameras? They are easy to find. But you can buy a really cheap remote and take the cord out. Search for Nikon MC-DC2 pinout. And then to find each terminal use a multimeter with continuity mode to find each lead. That’s what I did. Is it easy to find the MC-DC2 jack for nikon cameras? How is the bulb shutter problem on nikon cameras solved? Thanks! 1) If I am right (correct me if not) the dongle is always the same, on triggertrap official site they wrote you can just have one dongle and multiples cables for each camera, is this right? If this is right, then why do you say “The circuit is designed for all Canon”? 2) Why do we need 2×1.5kOhm and 2xtransistors ? 1.5kOhm resistors are needed as a phone protection and then the transistors amplify the signal after the resistors? My soldering was not up to par, and the mini connector was very cramped. Thought I would short something out, but it all worked perfectly with my canon t2i. Even the transistors I used were different, npn types that had almost the same specs, but no issues, which I got at radio shack. Assuming not critical since these are just switches. Worked for my iPhone and my old android. Thanks for the instructions. It would be awesome to improve this even more by adding wireless capability. For instance, connect (somehow) Trigger trap to a cheap triggers like Yongnuo RF 603 II to trigger the shutter from a distance. I have no skills in electronics whatsoever, but I bet this is something doable. I built this last night with 2n2222a transistors. When I pre-focus the camera the shutter releases just fine, but when the camera needs to focus, it’s not working right. I notice that the af assist light was firing intermittently, kind of flashing really. Any thoughts on what I should try? i build this but i am getting on focusing sound and that is coming automatically without doing anything, and apps is not working at all.. am i doing anything wrong?